Water can be very cold. It can be hard to see how deep it is. There may be strong currents. There may be hidden rubbish underneath - like shopping trolleys or broken glass. The water may be polluted and could make you unwell. You could catch a potentially lethal disease (Weil’s disease). It can be difficult to get out (the banks may be slippery or too steep). What should you do if you see someone in trouble in the water? Do not go in after them. If there is an adult nearby tell them at once. If there is a float or life buoy throw it to the person in the water. Use the nearest telephone and ring 999. Ask for the police, or the coastguard if you are at the beach. Keep off frozen ponds. Take care around rivers and lakes, they are extremely dangerous. Swimming is a lot of fun and is really good for you in a safe environment. 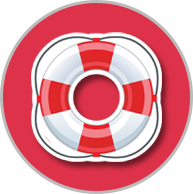 Life preservers or life belts are very important and can mean the difference between life and death to someone in trouble. Never play with them or tamper with them or remove them. Swimming in a cold river or lake - even on a very hot day is very different from swimming in a heated swimming pool. Many of the people who drown in rivers or lakes are good swimmers but cannot survive the effects of the cold water and strong currents. The sea can be a very dangerous place too. Before bathing always read the signs telling you about safe areas and the times of high and low tides. Always make sure that an adult knows where you are, and take care when using an inflatable toy or dinghy as you may be swept out by the tide or a hidden current and drown.